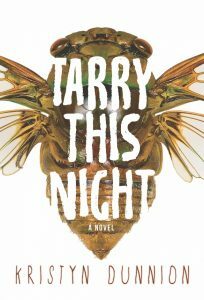 Tarry This Night by Kristyn Dunnion is a dystopian tale that takes readers through the days of a bunkered polygamist cult leader, Father Ernst, and his “family.” Told from the perspectives of various family members, Dunnion’s novel reflects a dark coming-of-age story about protagonist Ruth, who must reevaluate her faith in order to survive the fallout of civil war in America and the looming threat in her own quarters. Considering the current socio-political climate in the world, it’s no wonder why the dystopian genre has become so relevant. That’s what makes Tarry This Night both so interesting and terrifying. The novel touches upon several top-of-mind topics, including war, religion, power struggles, and gender relations. Dunnion has a haunting use of language that is almost lyrical, often leaving readers stunned at certain points when they realize the gravity of the horrors she’s weaving into the plot. Though at times brutal to read, Tarry This Night is ultimately a beautiful tale of female resistance. Father Ernst represents the patriarchal system, the unquestioned status quo, while his wives are the everyday people who must choose whether or not to toe the line. Heavy biblical references aside, Dunnion makes hope the focus of this story by creating incredibly strong characters that do so much more than just tarry the night and its burdens. After reading the wives’ stories, readers will question the “greater good” and grapple with what it truly means to progress in society. Tarry This Night is exactly the kind of story we need to remember what it means to endure despite the most dire circumstances.